Prince George's and Montgomery Counties are known for its rapid growth and development. Prince George's current population figures are listed at approximately 764,000 and rising. Part of the attraction to Prince George's and Montgomery Counties are their residents and businesses alike, and its centralized location and its rich diversity. Located in the heart of the Baltimore/Washington Common Market, Prince George's County covers 487 square miles and borders Washington D.C. on the East and is just 37 miles south of Baltimore. Prince George's and Montgomery Counties are just minutes from the political, social and cultural life of Washington, D.C. Kash King is proud to serve the Prince George's and Montgomery County communities. Service is our number one goal. 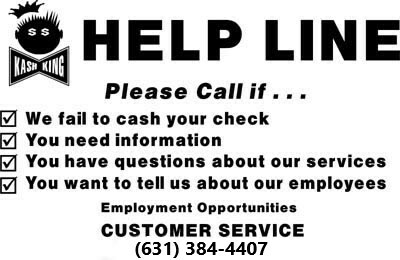 If you feel that you have not been well served by any of our employees, we have three methods of contacting our customer service department. You can use this form to submit an incident report and we will contact you within 72 hours. You may also send a letter to the address below or call our help line. Please be sure to include a copy of your receipt if you have one, the store location, date and time of the incident, and a good time for one of our customer service representatives to reach you. If you have completely filled in the form we will be able to assist you. Your request is now being sent to our office and a representative will be giving you a call within 72 hours. Requests for franchise opportunities will take longer. It is our plan to create a prospectus within the next year. We offer rewarding job opportunities with room for growth within the organization for the right individual. Please contact any one of our stores for more information. Kash King is an equal opportunity employer.